Regardless of whether you are a beginner taking to the roadways for the first time on your new road bike or are a rider that just wants to freshen their knowledge, it is incredibly important to know how and when to use your hand signals on your road bike. 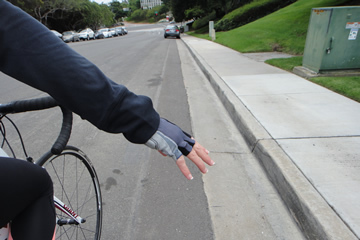 While you can use your state’s individual hand signals approved by your motor vehicle bureau for solo riding on the road and to signal to vehicles your intentions, you also must learn the appropriate hand signals for the cyclists in your group. This requires an additional language for clarity so that accidents do not occur. 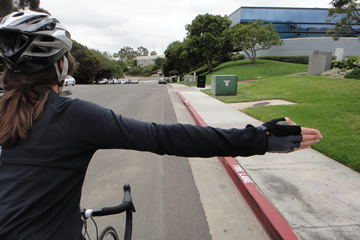 Cyclist hand signals are crucial for all members in the biking pack. You should, the safety of your group is in your hands. One thing you don’t want is to be in a biking group and accidently scatter onto different streets because of hand signal miscommunication. Not only is this pretty embarrassing (but no judgement, plenty of us have done it) but it can be dangerous if a rider behind you blindly follows your lead and harms themself if you put out the wrong hand sign in the middle of an intersection, for example. 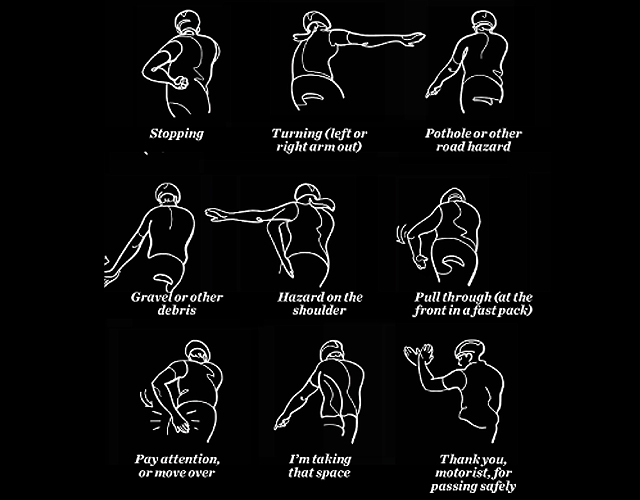 Luckily, the hand signals are pretty intuitive, even if you have never seen them before. 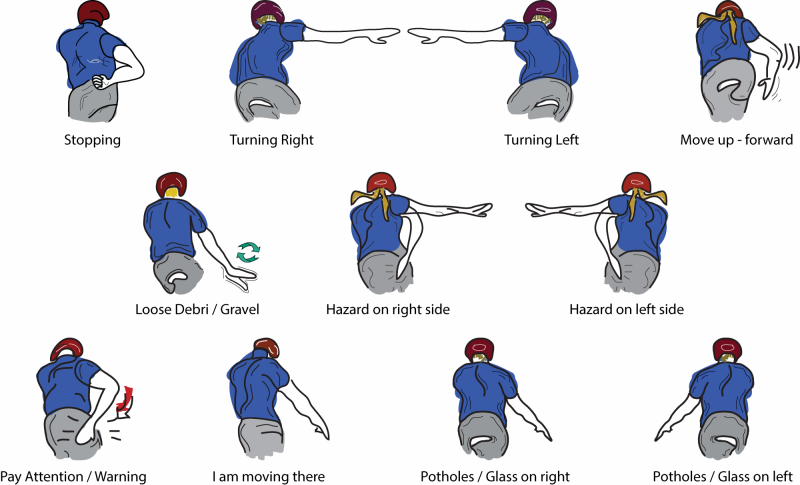 So, let’s get started — whether you are a group rider or the leader of a pack, it is important to have these hand signals down pat for immediate clarity and reaction for fellow riders while on the road. It is also up to the front rider (leader) to keep the group in a safe line/pack and the riders following must have faith in the group leader’s signals and actions — and be able to follow it safety and immediate to avoid accidents with each other or obstructions. Group leaders need to guide the group and point out hazards as shown in the photos, and steer everyone past them whilst pointing downwards at the hazard or pothole. It may be tempting to point out all small holes at first, but try pointing out hazards that clearly pose a danger if ridden over. If you have 7 to 15 people dodging around a tiny hole that would not cause harm can ruin the ride and cause problems. As the leader, you need to use clear and precise hand signals in order to alert your group of your intentions to turn, stop, speed up, request that another pulls up as leader, and so forth. 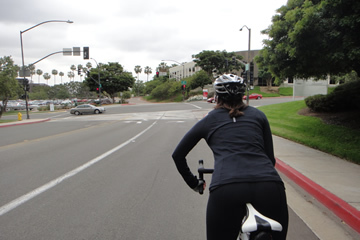 Don’t be afraid to use your voice — while this may not be helpful on loud, traffic-rich roads, on suburban roadways and tracks, using your hand signal while yelling an instruction such as “stop” is ideal — also, try to give riders plenty of notice if you can. Avoiding obstacles is key. Vehicles, holes, gravel, glass, concrete, medians, trees, bricks, pedestrians — avoiding these things is what keeps cyclists safe when in groups. Again, don’t point out every little rock or hole if the riders can avoid it just fine — remember, they have eyes too. Your job as group leader is to be the first eyes out there for riders behind you that cannot see ahead. 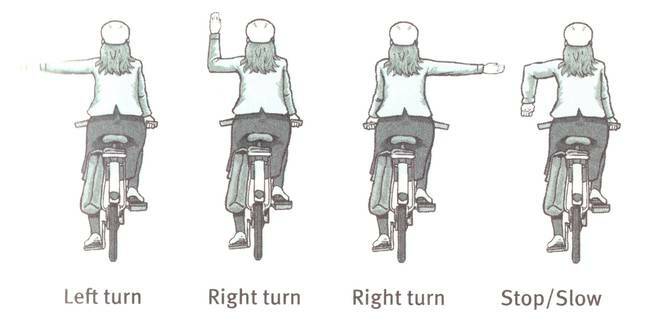 Using the signals shown in this article helps to keep everyone’s head in the game, eyes on the road and riders around them, and keeps their hands on their drops or handlebars. This equates to superior safety. 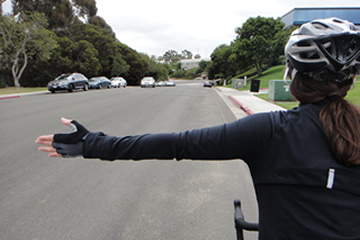 To signal to give way (to move out of the way of an obstruction), take your arm on the side of the hazard and bend it behind you in order to point across your back in the direction that the cyclists behind you will need to move. 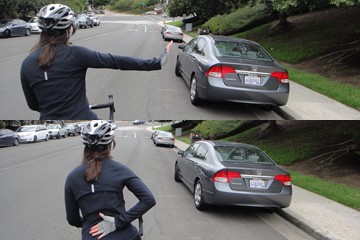 If you are riding with vehicles around you, use a fully extended arm and point in the direction you wish to move. If you want another rider in your group to come through, flick your elbow out on the side you want them to come through. Road safety is just as important to cyclists as it is motorcyle riders. 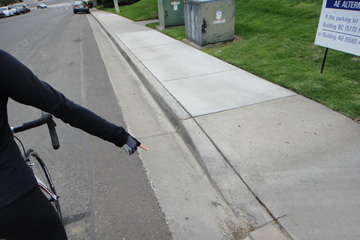 The roadway is not a minefield, but there are hazards on roads because of the unpredictability of pedestrians, other drivers, and hazards that may exist on any given day. So, learn your hand signals, use your voice if needed, and be sure the riders of your group know your hand signals as well. You can always adjust the signals to suit your specific group and agree upon certain signals if some are difficult to see or understand. With that, happy riding and stay safe!